​1-4 Tivoli Buildings and 1-3 Tivoli Place brings us to the corner of Tivoli Street. Immediately facing one on the opposite corner is the start of the long terrace of commercial properties that most people identify with Tivoli Place. However, this Terrace has not always been the neat row of attached properties that exist today and its present appearance dates from as recently as 1991. At that time the balconies were added and the break in the row of buildings where the builder’s yard of S C Morris was sited, was filled in to provide shops now occupied by Read Maurice, Charterhouse, Maison Chaplai’s and part of Vale Kitchens. 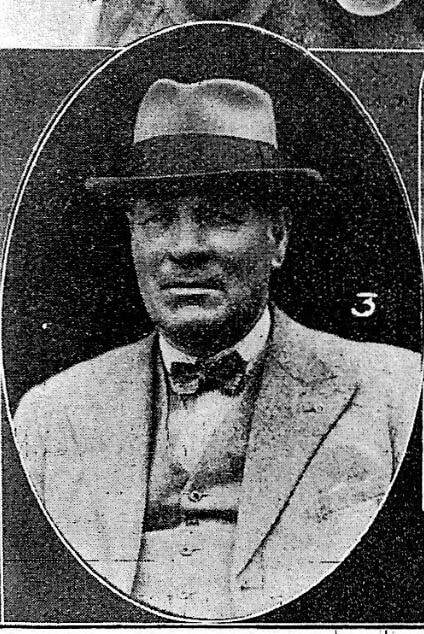 'Barrett, M; Coal Merchant, 19 Tivoli Place. ​Thomas Dover’s business may well have started some time before the first buildings were constructed in Tivoli Place and there is some evidence to show that he was responsible for the building of one of the house terraces in the late 1820s. Thomas died in 1841 aged 55, having been born in 1786, out of county. 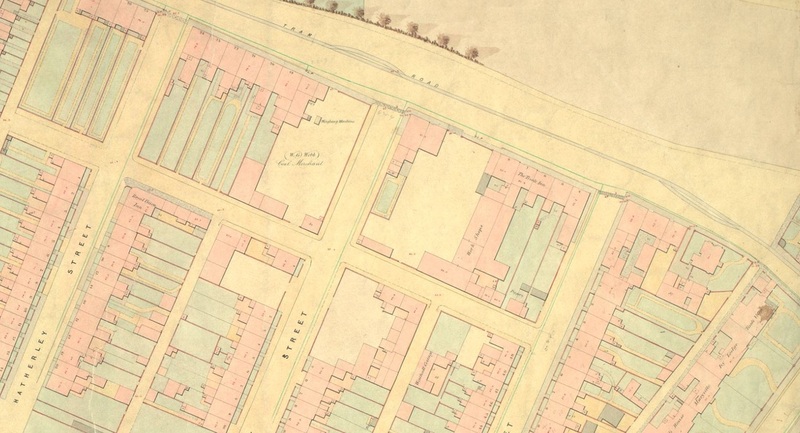 He was succeeded by his son George, and in the census of 1851 George and his family were living in number 19 Tivoli Place, now number 60a, and he is described as a builder and coal agent employing 45 men. George Dover, aged 41 was born in St Marylebone, Middlesex, and his wife, also aged 41, was born in Cranham, Gloucestershire. 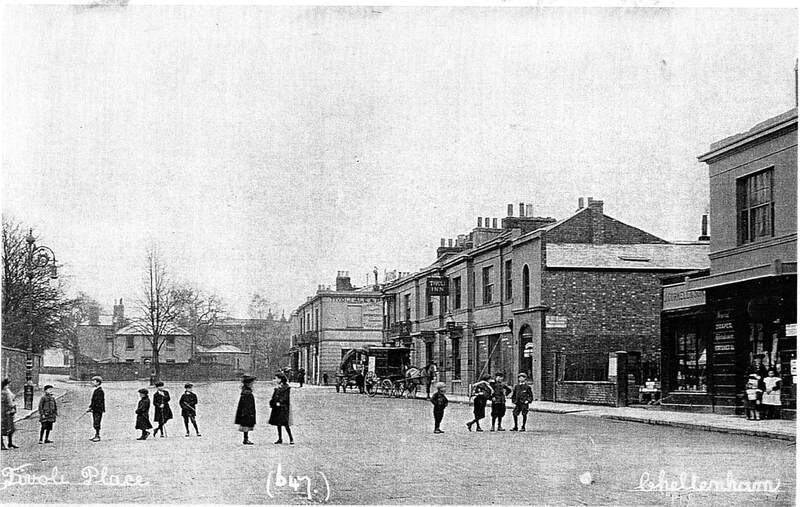 Their sons George aged 9, and John aged 6 were both born in Cheltenham, indicating that the Dovers were well established in the town by 1832. As number 19 is referred to in both the Dover and Barrett adverts, presumably this referred to the house, and also to the coal yard which, as suggested above, may have been a shared site. 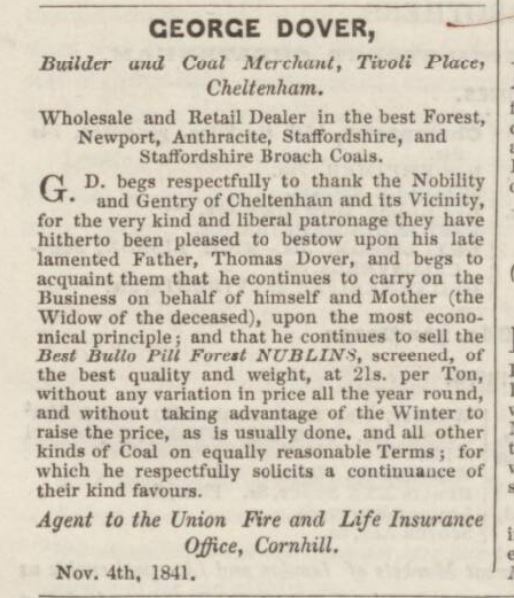 An 1841 advert indicates that George took over the business at the time of his father’s death. By 1851 George’s widowed mother was living next door to her son at number 20. She hailed from Holesworth in Suffolk, where she was born in 1780. Living with her was a family by the name of Cook – a husband and wife and four children. The children are listed as grandchildren of Mrs Dover. The mother of the four children, Esther Cook, had been born in St Marylebone where George Dover had been born so she may well have been his sister. ​When the family left Cheltenham is unclear but in 1861 George and his family were living in Shrewsbury where George is a surveyor and builder; son George is a farmer and son John, now aged 16 is still described as a scholar. The Dovers’ coal business was bought and continued by William John Webb who had started in business as a coal merchant on the Tewkesbury Road. In November 1886 there was a serious fire at Webb's coal yard in the hayloft above the stables at the back of the yard. Ten horses had to be rescued but the many hundreds of tons of coal was far enough away not to be at risk. One of William's sons became first Peoples’ Churchwarden of St Stephen’s Church, Tivoli in 1887, a position he held for five years. ​No further reference to the death has come to light, but presumably from other available information, this Thomas was a son of the founder. If he was the same person listed in the 1851 census as living at 94 Winchcombe Street he would have been 23 years old at the time of his death. The Cormell family had settled in Cheltenham at the latest by 1833 and their Tivoli Place premises ‘Lansdown Works, 8a Tivoli Place’ is now occupied by numbers 48-54. ​A third long-established building company which came to Tivoli Place was that of S C Morris & Son. It was founded by Mr S C Morris at Swindon Road in 1898. Their office and yard in Tivoli Place was purchased in 1916 from the firm of J.Cormell and Sons. 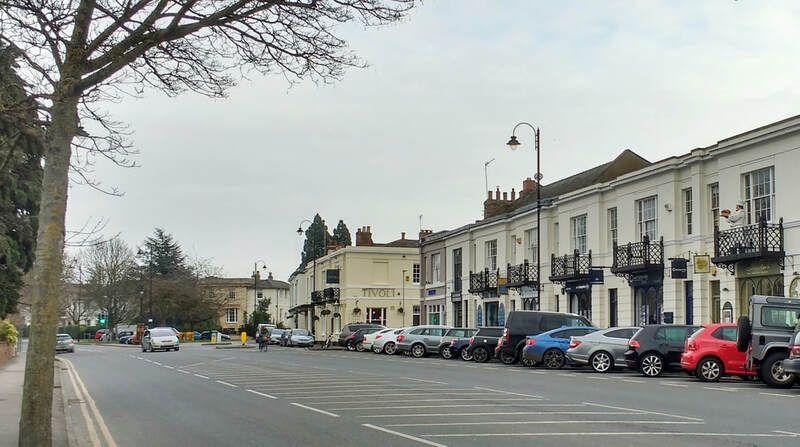 The firm carried out many important building contracts in Cheltenham, including the construction of houses in Greenhills Road, Charlton Park Gate and Leckhampton Road. In 1937 they were engaged to build the new Emmanuel church in Naunton Park. Morris had a large wood yard on the opposite side of Andover Road, now occupied by houses. Looking at the 1905 views of Tivoli Place, one can easily make out the break in continuity in the row of shops, showing the builders’ yard of Dover, Cormell and S C Morris. The infilling did not take place until 1991, marked by a Civic Society Plaque on the wall between Tivoli Trading and the Dry Cleaning shop. It was at this time that the whole terrace was infilled and upgraded. Balconies were placed above each premises and the shop fronts altered to their present uniform pattern. ​If you have any further information or photographs of these properties please let us know via the contacts page.